If you’ve spent much time surfing the web on an iPhone or iPad, you probably already know that Flash doesn’t work on either device. Sorry, but you cannot use Flash if you want your site to display well on an iPhone or iPad (although at this time, some apps are in the works that may allow you to view certain Flash files in the future). Fortunately, you can use CSS 3 to create beautiful, Flash-like effects, such as the planets orbiting the sun in the CSS 3 demo site shown. 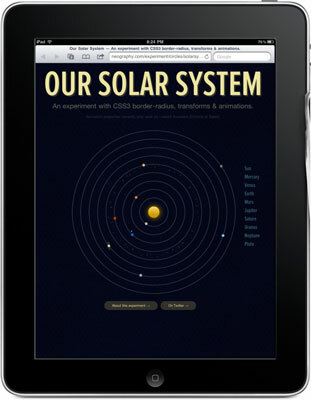 The app-like site is called Our Solar System, and it was created by the talented Alex Giron. Whole-site Flash implementations: The web is home to hundreds of thousands of Flash sites, many of which are being redesigned continually. Flash is ideal for web design. It scales well, and you can integrate animation and video in Flash files. Many restaurant owners, artists, and others were seduced into designing graphically complex, interactive features. Unfortunately, if you’ve designed your restaurant site in Flash, customers who want to find your address on the way to eat there or who want to review your menu on their iPhones or iPads are out of luck. Advertising banners: Advertisers fell all over themselves to design and insert Flash banners, for many of the same reasons that game developers and other site owners built all-Flash sites: It’s a quick way to add animated characters who dance and sing to grab your attention on the screen.